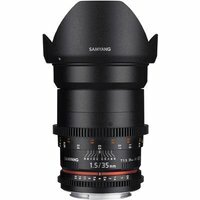 The Samyang 35mm T1.5 AS UMC II is a fast, manual focus video lens for Sony's full-frame E-mount compact system cameras, such as the a7 models. The lens has been developed primarily for professional video making purposes and features follow focus gearing and a de-clicked aperture ring to allow smooth, precise control over the focus and aperture whilst filming. The T number of 1.5 refers to the actual light transmission, which is more accurate, and is particularly important in the film industry where light readings are normally made manually. This bright lens is perfect for landscape, journalism, portraiture, travel and general shooting applications, such as lowlight photography. A detachable petal-shaped lens hood is provided.